• For quantitative colorimetric determination of Glucose-6-Phosphate concentration and evaluation of drug effects on its metabolism. • Fast and sensitive. Linear detection range (20 μL sample): 0.2 to 100 U/L for 15 min reaction. • GLUCOSE-6-PHOSPHATE DEHYDROGENASE (G6PDH) is a cytosolic enzyme in the pentose phosphate pathway which supplies reducing energy to cells by maintaining the level of the co-enzyme nicotinamide adenine dinucleotide phosphate (NADPH). 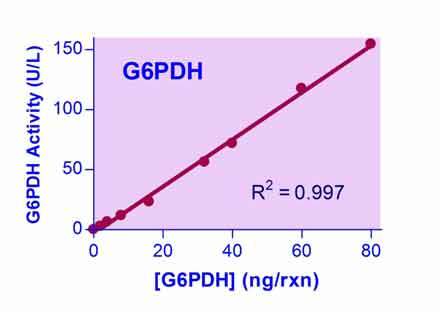 G6PDH reduces nicotinamide adenine dinucleotide phosphate (NADP) to NADPH while oxidizing glucose-6-phosphate (G6P). Humans with a genetic deficiency of G6PDH are predisposed to non-immune hemolytic anemia. BioAssay Systems? non-radioactive, colorimetric G6PDH assay is based on the reduction of the tetrazolium salt MTT in a NADPH-coupled enzymatic reaction to a reduced form of MTT which exhibits an absorption maximum at 565 nm. The increase in absorbance at 565 nm is proportional to the enzyme activity.